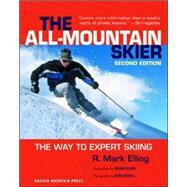 Skiing Books - Books on Sports - Sport Books: Catalog of books about your favorite sports. 2019 Skiing books on sale now. Buy your 2019 Skiing books with us today. We have many Skiing books to choose from and each purchase comes with the ease and convenience of Sportspool's online experience. We hope you find the Skiing book that is perfect for you! "''Covers more information than a week's worth of private lessons.' --'Ski magazine 'The All-Mountain Skier helps skiers advance their skills with a foolproof, self-instructional program for mastering advanced techniques in even the most challenging conditions. Drawing from his extensive experience as a ski professional, instructor Mark Elling delivers essential advice and information--including tips from other expert skiers--to help readers perform like pros."